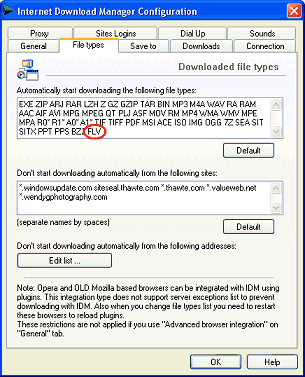 IDM will start downloading the video and show its standard download dialog. If the server has not specified the file name explicitly, IDM will name the file based on the web page title. You can also edit the filename, add a description, and change its path or category on this dialog. It's also possible to add FLV extension to IDM list of downloadable file types in IDM Options -> "File Types" tab to take over the download of all FLV videos. In this case videos won't be played in your browser. The videos will be downloaded by IDM, saved to your local disk, and can be played if you have an FLV player.